This Friday presents me with a beer from Lumberyard Brewing in Flagstaff, Arizona. It is their Red Ale. Lumberyard is owned by Beaver Street Brewing, also in Flagstaff. I recall eating there several years ago. I liked the restaurant, I recall the food being pretty good. However, I recall little of the beers. I know I ended up with this beer – as opposed to La Fin Du Monde or a Chimay or a Samuel Smith. It’s because a friend mentioned it last weekend. It seemed only fitting to have music playing as I drank this beer (since we used to play in a band together). Tesla ended up being the soundtrack for this beer. It’s also called a Special Bitter Ale. I hope that is a British pub reference and not an allusion to tons of hops. I expect a brilliant red color, a medium bodied and easy to drink ale, mid-range on the hops and a malty character, though nothing bready and caramelized. It’s 5.6% in alcohol, a little towards the higher end of average. Now it is time to pour. I find it more orange than red. I now fear the hops for I can smell them in the pour, the strong northwest type. Now I see a picture of hops on the bottle. What does that portend? I heard good things from my friend about this brewery; now the time has come to put the beer to the test. I wait for the head to descend. It is a nice creamy head, like frosting. Another whiff of hops wafts up from the head. It smells like I’m brewing my own batch, these hops are so pronounced. It smells like a Sierra Nevada beer. It tastes like a pale ale with a little more body. The hops present in the nose are in this medium sized body but not like a terrible conqueror, just a simple visitor. But the warmer it gets the more puckery the hops aftertaste becomes. A couple of times it nearly comes across like a heavy brown ale. The crystal malts made a swift, sweet appearance then ran away. Almost a touch of cinnamon in there. Naw, couldn’t be. 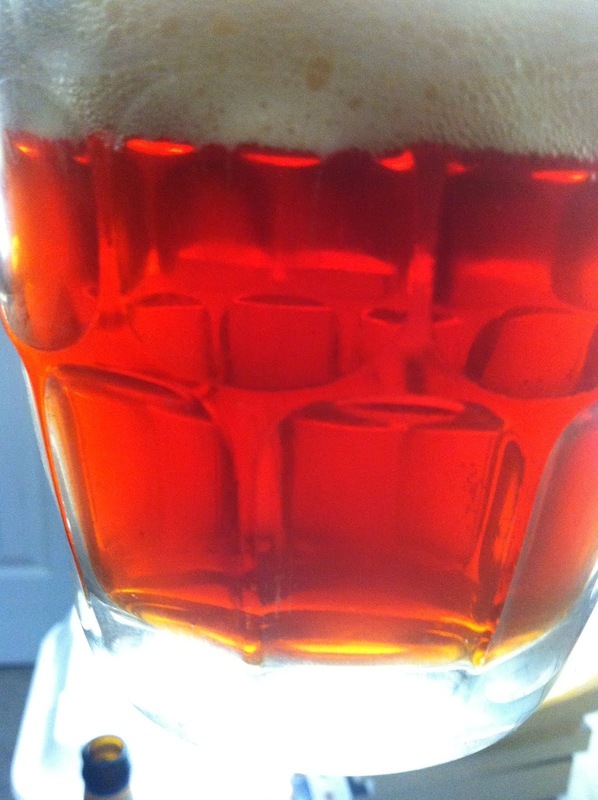 So, does this red (orange) pale ale make me want to run out and visit the Lumberyard? Yes, duh! I’m a brewer and a beer fan. This is a ‘Zona brewery and I’m all for supporting local breweries (Flagstaff is as local as poor Kingman gets) unlike Mohave County or Mohave State Bank. Anyway, let’s don’t go there. Yes, the Red Ale is well made if not what I expected. It’s simply an orange colored pale ale. The Lumberyard also has a Belgian Style beer I’d love to try and I hope its closer to expectations than this one. As noted above, I was listening to Tesla whilst imbibing. It was Times Makin’ Changes. I believe that the guys did a brilliant job on their cover of “Signs”. Additionally, it seems that the gist of that song can apply to beer, too, no? Do we really need to label beers by style? Or does that just ‘block out the scenery’?